Current Mansfield Fellow Ian Morrison was invited to the The 11th Global Earth Observation System of Systems Asian Pacific Symposium (GEOSS AP) that was held in Kyoto from 24th to 26th October 2018, by the Group on Earth Observations (GEO) and Japan’s Ministry of Education, Culture, Sports, Science, and Technology (MEXT). The Symposium, was attended by 163 participants including the H.E. Mr. Palitha Range Bandara, State Minister of Irrigation and Water Resources and Disaster Management of Sri Lanka. The Symposium addressed the theme of “Strengthening Regional Cooperation through Asian Oceania GEOSS for the United Nations Sustainable Development Goal’s, Paris Agreement and Sendai Framework“. 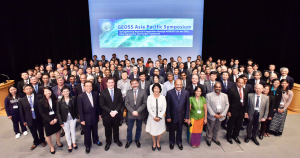 Leading scientists from the Pacific-Asia region and beyond came together to share progress of Earth’s monitoring systems and the work being done to combat the negative effects of climate change. Morrison’s host agency, the International Centre for Water Hazard and Risk Management (ICHARM), was the main facilitator of the Symposium. ICHARM focuses on three principal areas of activity – research, training and information networking, contributing to the reduction of water-related disaster damage around the world. Drought, natural disasters, heavy rainfall, sea level, and deforestation are all on the rise. The Symposium attendees are working to monitor and reduce the effects through research and sustainable actions across the Asian Pacific. 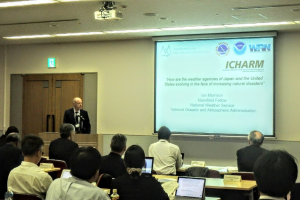 Morrison’s presentation highlighted how the United States and Japan’s weather agencies are combating a steady increase in natural disasters through education, evolving communication through Impact-Based Decision Support Services, and improving the science of the forecast. The 11th Symposium concluded with the reading of the Kyoto Statement 2018 with the participants agreeing to the written outcomes and actions on the Agenda for Sustainable Development, Paris Climate Agreement, and the Sendai Framework for Disaster Risk Reduction, among others, and resolved to take the actions toward the next Symposium in 2019. This entry was posted in Fellowship Experiences and tagged International Centre for Water Hazard and Risk Management (ICHARM), MFP No. 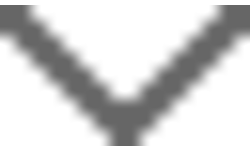 23, Ministry of Education Culture Sports Science and Technology, National Oceanic and Atmospheric Administration, U.S. Department of Commerce, UNESCO. Bookmark the permalink.